I'm never sure how to properly sum up a weekend like the one that just came to a close. Because so much unfolds in such a short space of time – where can I even begin? Planning and preparations melt into excitement and nerves, which soon give way to ease as friendships begin and connections are made. Stories are told, experiences are shared, and strangers quickly become friends. And then, as suddenly as it began our time together came to a close. If pressed, I would sum up our weekend like so: nourishment and rest, connection and conversation, tears and laughter, learning and play, refilling and recharging. Our group was a just right mix of (brave!) introverts and at ease extroverts, all learning and sharing side-by-side. A community of women coming together from places as far flung as California, Colorado and Indiana; and from all corners of Wisconsin and Minnesota. The weekend began with a bang and a crash when a pair of spruce trees came down in a fierce storm, blocking the driveway but sparing our cars by just a few feet. 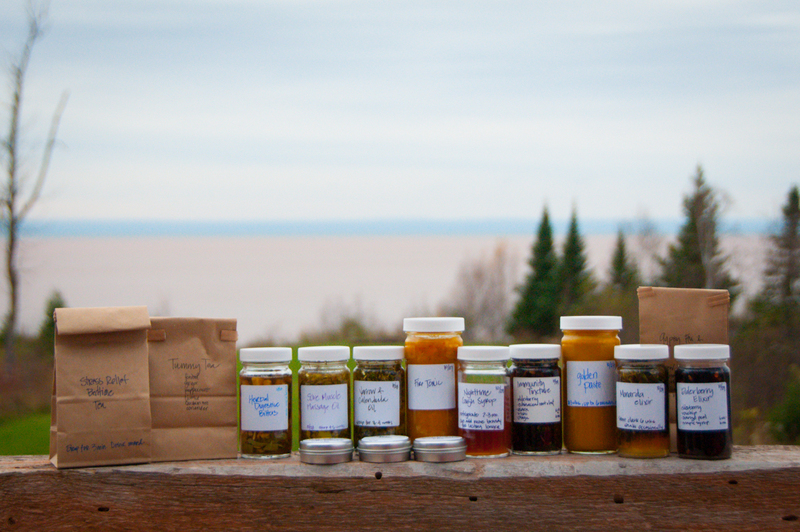 Once that excitement passed the relaxed weekend energy unfolded and everyone found ample time to craft and make art, relax by the fire, eat glorious food, explore the Northwoods and the lake shore, and – of course – learn about and make herbal remedies. I am so grateful to share the weekend with this amazing community of women. Fifteen joined me here (fourteen pictured above, on account of an early flight), and I daresay many new friendships were forged. My summary? 100 belly laughs, 15 brave women, over a dozen herbal recipes, 9 organic meals, 4 glorious days, 1 beautiful barn, and 1 big lake. And what a wonderful weekend it was! Thanks for this wonderful few days, ladies. You are beautiful souls – each and every one.